This line closed on March 20, 1965 following the Beeching Axe, and the original station was demolished in 1970. The line was reopened on 9 April 1984. Saltaire station is unstaffed and is equipped with basic shelters and a wooden platform. This line is known as the Airedale line and is a busy commuter line between Skipton and Leeds/Bradford. The station shelters are clad in local stone. The railings to the ramp were designed to match the original railings, and the overhead line equipment was painted black to be less visually intrusive. 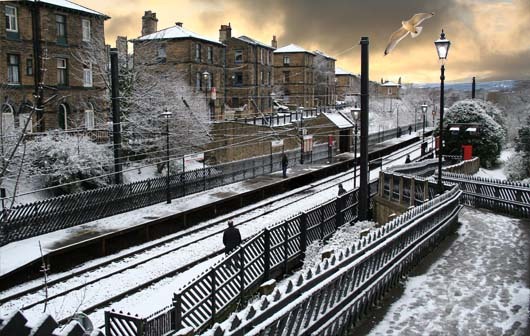 Saltaire Railway Station, 2010. Image by Pamela Reynolds.